Fort George G. Meade is a United States Army installation located in Maryland, that includes the Defense Information School, the Defense Media Activity, the United States Army Field Band, and the headquarters of United States Cyber Command, the National Security Agency, the Defense Courier Service, Defense Information Systems Agency headquarters and the U.S. Navy's Cryptologic Warfare Group Six. It is named for George G. Meade, a general from the U.S. Civil War, who served as commander of the Army of the Potomac. The fort's smaller census-designated place includes support facilities such as schools, housing, and the offices of the Military Intelligence Civilian Excepted Career Program (MICECP). Initially called Camp Annapolis Junction, the post was opened as "Camp Admiral" in 1917 on 29.7 sq mi (77 km2) acquired for a training camp. The post was called Camp Meade Cantonment by 1918, Camp Franklin Signal Corps school was located there and in 1919, the Camp Benning tank school—formed from the World War I Camp Colt and Tobyhanna schools—was transferred to the fort before the Tank Corps was disbanded. Renamed to Fort Leonard Wood (February 1928 – March 5, 1929), the fort's Experimental Motorized Forces in the summer and fall of 1928 tested vehicles and tactics in expedition convoys (Camp Meade observers had joined the in-progress 1919 Motor Transport Corps convoy). In 1929, the fort's 1st Tank Regiment encamped on the Gettysburg Battlefield. During World War II, Fort Meade was used as a recruit training post and prisoner of war camp, in addition to a holding center for approximately 384 Japanese, German, and Italian immigrant residents of the U.S. arrested as potential fifth columnists. The Second U.S. Army Headquarters transferred to the post on June 15, 1947; and in 1957, the post became headquarters of the National Security Agency. From the 1950s until the 1970s, the Fort Meade radar station had various radar equipment and control systems for air defense (e.g., the 1st Martin AN/FSG-I Antiaircraft Defense System). Fort Meade also had the first Nike Ajax surface-to-air missiles in December 1953 (operational May 1954) and an accidental firing occurred in 1955 with Battery C, 36th AAA Missile Battalion. In 1962, the Army's Headquarters and Headquarters Battery, 13th Air Defense Artillery Group, transferred from Meade to Homestead AFB for initial deployment of MIM-23 Hawk missiles, and during the Cuban Missile Crisis, the 6th Battalion (HAWK), 65th Artillery at Fort Meade (a United States Strike Command unit) was deployed to the Miami/Key West area (the 8th Battalion (Hawk) was at the fort in late 1964). Fort Meade bomb disposal experts were dispatched to secure nuclear bombs in the 1964 Savage Mountain B-52 crash. In 1977, a merger organized the fort's U.S. Army Intelligence Agency as part of the United States Army Intelligence and Security Command. On 1 October 1991, a wing of the Air Force Intelligence Command transferred to Fort Meade, and the organization was replaced by[not in citation given] the 70th Operations Group on May 1, 2005. In the early 1990s, 12.7 sq mi (33 km2) was transferred from the post to the Patuxent Research Refuge. A planned closure of the post in the 1990s was not implemented,[when?] and the Defense Information School moved to the fort in 1995. The 311th Signal Command headquarters was at Fort Meade from 1996 – September 2006. The 70th Intelligence Wing headquarters was established at Fort Meade on July 17, 2000, and the Base Realignment and Closure, 2005, designated Fort Meade to gain 5,700 positions. "Fort Meade currently has more than 54,000 employees (service members and civilians), and is the largest employer in the state of Maryland and second largest installation by employee population in the Army. After an August 27, 2007, U.S. Environmental Protection Agency order to assess the contamination at 14 hazardous waste sites on Fort Meade (e.g., ordnance disposal area, 1940s waste dump, closed sanitary landfill), a September 2007 environmental impact report identified adding two golf courses would be a "significant threat to the biological and territorial integrity of the Patuxent Research Refuge". The US Army responded it is taking steps[specify] to limit the environmental damage. On March 30, 2015, National Security Agency police officers shot and killed a person who attempted to drive an SUV through a restricted entrance to the NSA campus in Fort Meade, Maryland. A passenger in the SUV was injured, as was an officer, and both were treated at a hospital. President Obama was briefed but the FBI determined "we do not believe it is related to terrorism." On February 14, 2018, National Security Agency police officers shot and wounded an individual who rammed an SUV into a barricade near an entry gate outside of the facility. In the immediate aftermath of the event, the NSA announced that there was "no ongoing security or safety threat." 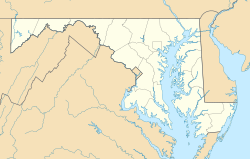 Fort Meade is bordered by the Baltimore–Washington Parkway on the west and is about 5 miles (8.0 km) east of Interstate 95. It is located between Washington, D.C. and Baltimore. It is located in proximity to Odenton, Columbia, Jessup, Laurel, and Severn. Fort Meade is used as a storage facility for the United States Library of Congress. In 1994, a 100-acre site located in the U.S. Army Base at Fort Meade, MD was transferred to the U.S. Congress to provide additional storage capacity for the Library of Congress and other legislative bodies. The current master plan includes the land to construct up to 13 Phased Storage Modules for collections, if this number is needed. In subsequent years Congress provided construction funds in the Architect of the Capitol budget for Module 1, completed in 2002, for Module 2, completed in 2005 and Modules 3 and 4 and four cold storage rooms, completed in 2009. A full scale three year transfer program of the special format collections to Modules 3 and 4 and the four cold storage rooms began in Spring 2010 and was completed in September 2012. Module 5 has been fully funded. Design is currently being finalized, and occupancy is scheduled for September 2017. The state-of-the art Storage Modules are being built to store, preserve and protect the Library's collections. Collections include books and bound periodicals as well as special format collections, such as maps, manuscripts, prints, photographs, sheet music, and microfilm masters. If needed and constructed, the 13 collections storage modules will provide a total of 180,600 gross sq ft of archival storage space for the Library's collections. The NSA maintains a shuttle service from the Odenton station of MARC to its Visitor Control Center at Fort Meade; it has done so since 2005. In 2009 the U.S. Army established a similar shuttle service from Odenton station to the Army section of Fort Meade; the NSA operates this service, allowing garrison employees, persons with Fort Meade visitor passes, and U.S. Department of Defense IDs to board. ^ "Fort George G. Meade (2512196)". Geographic Names Information System. United States Geological Survey. Retrieved 2011-09-02. ^ "CWG-6". public.navy.mil. 9 June 2017. Retrieved 20 February 2019. ^ Supplemental History of Construction at Camp Meade, Including Completion Report of Camp Franklin Signal Corps school.http://www.ftmeade.army.mil/museum/archives/Arch. Admiral, MD: February 1919. Weiss, Dreyfous and Seiferth Office Records, Southeastern Architectural Archive, Special Collections Division, Tulane University Libraries. ^ Rockenbach, Samuel D (October 13, 1919). Report of the Director of the Tank Corps for the year ending June 30, 1919. Congressional serial set, Issue 7688 (Report). Retrieved 2011-01-17. ^ "Gen. Leonard Wood Memorial Authorized By Chief of Staff" (Google News Archive). The Telegraph-Herald and Times-Journal. February 19, 1928. Retrieved 2011-09-02. ^ a b "Fort Meade history". Fort Meade. Archived from the original on 2011-11-11. Retrieved 2011-09-03. ^ "1930 Reports". Gdg.org. Retrieved 2012-09-04. ^ "NSA/CSS Timeline - 1950s - NSA.gov". NSA.gov. Retrieved 2017-10-14. ^ United States Army Air Defense School (1965). "USAADS Digest 1965, Chapter 2: Air Defense Doctrine And Procedures" (PDF). Ed Thelen's Nike Missile Web Site. Ed Thelen. ^ Jerry Wilkinson. "North Key Largo Missile Site". Keyshistory.org. Retrieved 2012-09-04. ^ "UFO Report". Nicap.org. 1964-12-19. Retrieved 2012-09-04. ^ "Inside 70th ISR Wing". 70th ISR Wing. 70ISRW.AF.mil. Retrieved 2011-09-05. ^ "DINFOS History". Dinfos.osd.mil. Archived from the original on 2012-09-13. Retrieved 2012-09-04. ^ Larry Whitley, , Ft. Meade Soundoff, February 14, 2018. Fort Meade is currently undergoing another major transformation and is expecting another 8,000-10,000 employees by 2023. ^ a b "Ribbon Cutting Celebration..." DISA.mil. April 2011. Retrieved 2011-09-03. ^ Myers, Amanda Lee (March 6, 2015). "Hong Young's Estranged Wife Said He Acted 'Crazy' Before NSA Building Shooting". The Huffington Post. Associated Press. Archived from the original on April 3, 2015. Retrieved March 30, 2015. ^ Schaffer, Christian (March 31, 2015). "Transgender woman who was shot dead trying to ram SUV through NSA gate was a 'homeless prostitute who was facing prison time". ABC News. Archived from the original on April 5, 2015. ^ White, Brian (February 14, 2018). "Suspect wounded, SUV stopped after shooting at NSA gate". MSN. Associated Press. Retrieved February 14, 2018. ^ "Managing the Collections: Fort Meade Update". Library of Congress. October 10, 2015. Retrieved May 22, 2017. ^ "Fort George G. Meade Museum – Home Page". Ftmeade.army.mil. 2008-06-02. Retrieved 2012-09-04. ^ a b "Army senior leaders meet with Fort Meade residents, Soldiers and housing staff". U.S. Army. February 14, 2019. Retrieved February 16, 2019. ^ "US Army statement on military housing". U.S. Army. February 13, 2019. Retrieved February 16, 2019.